Have you been searching for a new flooring solution for your home? Update the look of your home with a strong and chic floor option: tile floors. In Bedford, Goedecke Paint & Decorating provides a variety of tile choices to outfit your household giving you a quality floor that will last for years to come. Requiring minimal attention, tile is a wonderful choice for families with kids and people on the go. Choosing to have tile put in your household will give it an instant makeover. No matter what kind of gorgeous tiling you like, whether porcelain, ceramic metal or glass, Goedecke Paint & Decorating provides an array of styles to pick from. Since tile flooring is available in varied patterns, each flooring option will be unique and exquisite. Tile pieces constructed from natural materials, including granite and limestone, do not ever look exactly alike. Not only is tile flooring an eye-catching choice, it is also a great option for many rooms throughout the home. 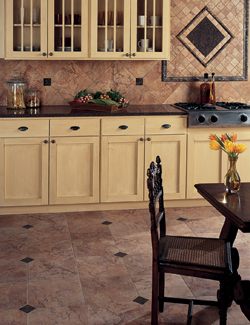 Resistant to water and moisture, tile works especially well in kitchens and bathrooms where spills often occur. It is also a popular option in living rooms, dining rooms, hallways and entryways. You will enjoy its convenience because you will never have to vacuum! Call <PHONE> now for a top-rate deal on new flooring for your home.